The famous Orient-Express doesn’t exist only in the movies. Join us for a real-life overnight train ride between these two Italian cities. This small boutique hotel is giving other Venetian establishtments a run for their money. Learn about their five theme rooms. You won’t forget a stay here. Our writer finds that this Florentine gastronomia isn’t quite like any other Italian deli she has visited. Love Shoes? Make this museum a stop on your next visit to Florence. 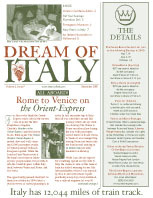 Celebrate New Years in Italy; review of a train tour; information on the countrywide January sales.